Carnival Splendor Fire Redux: This Again? (12:10 p.m. EST) -- Carnival Cruise Lines is offering compensation to passengers on the fire-disabled Carnival Triumph as well as those booked on now-canceled sailings through April 13. Passengers on the ill-fated voyage will receive full refunds, inclusive of gratuities and transportation expenses. In addition, they will receive future cruise credits equal to the amount paid for this voyage as well as reimbursement of all shipboard purchases during the sailing, except gift shop, art and casino charges. They will also receive an additional compensation of $500 per person. In a press release, Gerry Cahill, Carnival's president and CEO, explained: "We know it has been a longer journey back than we anticipated at the beginning of the week under very challenging circumstances. We are very sorry for what our guests have had to endure. Therefore ... we have decided to provide this additional compensation." Passengers booked on cancelled sailings through April 13 will receive a full refund of their cruise fare, as well as nonrefundable transportation costs, pre-paid shore excursions, gratuities and, government fees and taxes. They also will receive a 25 percent discount on a future three- to five-day Carnival cruise or a 15 percent discount on a six- to seven-day cruise. As to non-refundable purchases like shore excursions not booked through the line, the line said it is handling those on a case-by-case basis. Carnival says it's in contact with affected passengers. As for passengers on Carnival Elation, which detoured to provide supplies to Triumph on February 10, and Carnival Legend, which off-loaded food and water Monday, no compensation is being offered. Carnival Elation was en route to Progreso, Mexico, when it stopped to offload supplies to Triumph, but its arrival there was not delayed, according to a Carnival spokesman. 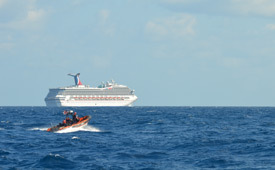 Carnival Legend was on a scheduled sea day when it delivered supplies and the ship called in Cozumel Tuesday as planned.